Caribbean Community (CARICOM) leaders are likely to issue a statement regarding the ongoing political developments in the Haiti where opposition parties have been staging street demonstrations to force President Jovenel Moise out of office. Regional leaders have gathered here for a special two-day summit on the CARICOM Single Market and Economy (CSME) that allows for free movement of goods, skills, labour and service among the majority of the 15-member grouping and CARICOM Secretary General Irwin LaRocque told the Caribbean Media Corporation (CMC) it is “very likely” that the Haitian situation would be discussed. He said that Moise will be among the regional leaders at the table during the two-day summit and that CARICOM is concerned about the situation in the French-speaking nation. “Yes we are concerned and as we have been saying in the past, we call for dialogue and for a peaceful resolution,” LaRocque said. Last week, Canada called on the political parties in Haiti to find a solution to the ongoing political situation as the United States authorised the departure of non-emergency government personnel and their families from the country. 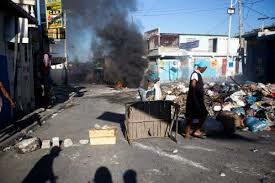 Canada’s Foreign Minister Chrystia Freeland and International Development Minister Marie-Claude Bibeau in a joint statement said the North American country “is very concerned about the recent civil unrest in Haiti and is deeply saddened by the loss of life”. The opposition parties have been staging street demonstrations in support of their calls for President Moise to step down after accusing him of not investigating allegations of corruption in the previous government over PetroCaribe, an oil alliance of many Caribbean states with Venezuela to purchase oil on conditions of preferential payment. But, in a radio and television broadcast last week, Moise dismissed calls for his resignation. St Lucia’s Prime Minister Allen Chastanet has also expressed concerns about the development taking place in Haiti. “It is a very sad situation in Haiti until we can all resolve the difficulties of Haiti, Haiti continues to be an incredibly poor country, very very divided and despite the best efforts of a lot of people…I don’t think any of us can say the issues have been resolved. 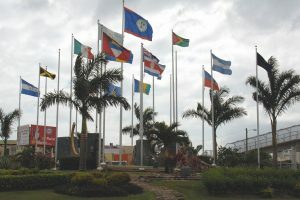 “I don’t think any government by itself is going to resolve the issues, so it is about holding the President’s hand and working with the people of Haiti but there has to be a special task force to be able to deal with the medium and long term problems of Haiti,”Chastanet said, adding he is awaiting the deliberations on Haiti during the meeting here.